To minimize the risk of data loss through hardware failure, Baqend stores all your data in a threefold replicated cluster spanning multiple availability zones. To also shield you against human or other errors that may result in data loss, Baqend makes periodic backups which you can import into any off-the-shelf MongoDB database. Baqend automatically creates weekly backups for Indie apps and daily backups for higher plans, every morning at 6 AM (UTC). 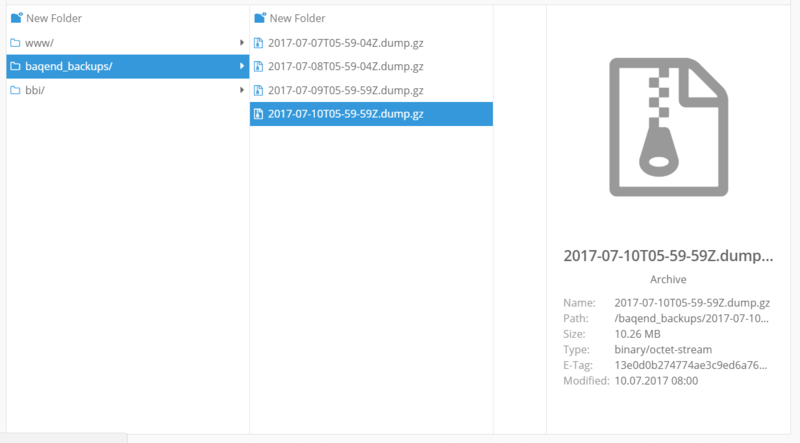 Every backup is a downloadable MongoDB dump archive located in the baqend_backups/ file directory. The used backup storage will be charged like normal file storage. By default, the MongoDB backups will be retained for 30 days before they are removed. If you prefer a custom retention period, contact us via mail at support@baqend.com or via chat. Baqend does not allow resetting your cloud-hosted app database to the exact state of a backup file, because resetting database state might override modifications that took place after the backup had been taken. To make sure this doesn't happen, the recovery procedure lets you (1) restore the backup file to a Baqend instance local to your machine, (2) export relevant data from the restored local instance and (3) import the lost data to your cloud-hosted app database. Download and install MongoDB from the official MongoDB download page or by using the package manager of your OS. Make sure to use the official MongoDB installation, because it contains the mongorestore command which is required for the recovery procedure. Also make sure to install MongoDB version 3.4 or higher. Download the latest Baqend Community Editon from our download page. Install the Baqend CLI tool as described in the Baqend CLI guide section. Remove the state.json file from the data directory to remove any pre-installed tables from the Community Edition. Start a local Baqend instance by launching the baqend.bat or baqend.sh script. A local version of the Dashboard should open automatically (http://localhost:8080/v1/dashboard). When prompted, provide your Baqend account credentials. When prompted, provide the default user credentials (username root and password root). Reload The dashboard. You should see your custom data collections now. Enter your app and open the baqend_backups/ directory in the File Explorer. Download the backup file you want to recover data from. Reload the dashboard of your local instance again. The recovered data should appear. You can now export individual objects or entire collections from your local Baqend app and then import them into your cloud-hosted app using the export and import functionality.